Stina is a cute, sideways knit baby kimono, perfect for bundling up a new arrival. It is designed by the talented Asa Tricosa who also designed the popular Dido Shawl. Instructions are given for two sizes: 0-3 months and 9-12 months. 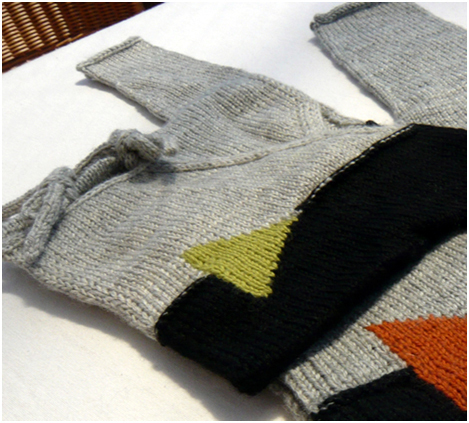 The pattern uses two colours of double knit yarn plus a small amount of a third colour for the contrast triangle. Stina uses an unusual construction method and comprehensive instructions guide you through the process. To see what others have made from this pattern, please visit the Stina pattern page on Ravelry. Stina uses double knit (DK) weight yarn with 100g of colour A, 50-100g of colour B and a small amount of colour C for the triangle motif.